To allow freedom regarding the choice of management protocol, the OSGi Specifications assumes an architecture to remotely manage a OSGi framework with a Management Agent. The Management Agent is implemented with a Management Bundle that can communicate with an unspecified management protocol. This specification defines how the Management Agent can make its way to the OSGi framework, and gives a structured view of the problems and their corresponding resolution methods. The purpose of this specification is to enable the management of a OSGi framework by an Operator, and (optionally) to hand over the management of the OSGi framework later to another Operator. This approach is in accordance with the OSGi remote management reference architecture. This bootstrapping process requires the installation of a Management Agent, with appropriate configuration data, in the OSGi framework. This specification consists of a prologue, in which the principles of the Initial Provisioning are outlined, and a number of mappings to different mechanisms. Policy Free - The proposed solution must be business model agnostic; none of the affected parties (Operators, SPS Manufacturers, etc.) should be forced into any particular business model. Interoperability - The Initial Provisioning must permit arbitrary interoperability between management systems and OSGi frameworks. Any compliant Remote Manager should be able to manage any compliant OSGi framework, even in the absence of a prior business relationship. Adhering to this requirement allows a particular Operator to manage a variety of makes and models of OSGi framework Servers using a single management system of the Operator's choice. This rule also gives the consumer the greatest choice when selecting an Operator. Flexible - The management process should be as open as possible, to allow innovation and specialization while still achieving interoperability. Provisioning Service - A service registered with the Framework that provides information about the initial provisioning to the Management Agent. Provisioning Dictionary - A Dictionary object that is filled with information from the ZIP files that are loaded during initial setup. 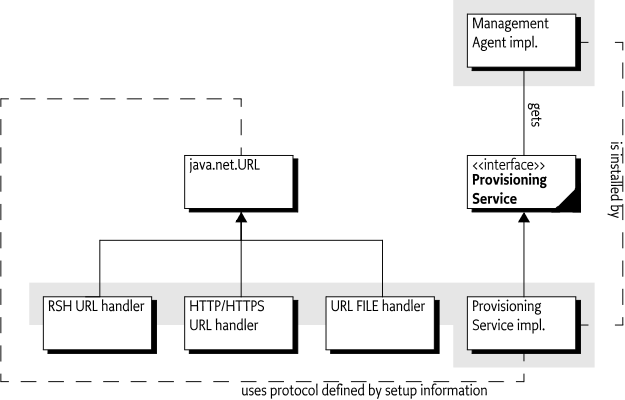 RSH Protocol - An OSGi specific secure protocol based on HTTP. Management Agent - A bundle that is responsible for managing a OSGi framework under control of a Remote Manager. The following procedure should be executed by an OSGi Framework implementation that supports this Initial Provisioning specification. When the OSGi framework is first brought under management control, it must be provided with an initial request URL in order to be provisioned. Either the end user or the manufacturer may provide the initial request URL. How the initial request URL is transferred to the Framework is not specified, but a mechanism might, for example, be a command line parameter when the framework is started. Before the request URL is executed, the OSGi framework information is appended to the URL. This information includes at least the OSGi framework Identifier, but may also contain proprietary information, as long as the keys for this information do not conflict. Different URL schemes may use different methods of appending parameters; these details are specified in the mappings of this specification to concrete protocols. The result of the request must be a ZIP file. (The content type should be application/zip). It is the responsibility of the underlying protocol to guarantee the integrity and authenticity of this ZIP file. This ZIP file is unpacked and its entries (except bundle and bundle-url entries, described in Table 110.2 ) are placed in a Dictionary object. This Dictionary object is called the Provisioning Dictionary. It must be made available from the Provisioning Service in the service registry. The names of the entries in the ZIP file must not start with a solidus ('/' \u002F). The manifest header InitialProvisioning-Entries of the given ZIP file. This header is defined in InitialProvisioning-Entries Manifest Header. If this header is present, but a given entry's path is not named then try the next step. The extension of the entry path name if one of .txt, .jar, .url extensions. See Table 110.1 on page for the mapping of types, MIME types, and extensions. The types can optionally be specified as a MIME type as defined in  MIME Types. The text and bundle-url entries are translated into a String object from an UTF-8 encoded byte array. All other entries must be stored as a byte. Must be represented as a byte array (byte). Entries must be installed using BundleContext.installBundle(String, InputStream), with the InputStream object constructed from the contents of the ZIP entry. The location must be the name of the ZIP entry without leading solidus ('/' \u002F). This entry must not be stored in the Provisioning Dictionary. If a bundle with this location name is already installed in this system, then this bundle must be updated instead of installed. The MIME_BUNDLE_ALT version is intended for backward compatibility, it specifies the original MIME type for bundles before there was an official IANA MIME type. The content of this entry is a string coded in utf-8. Entries must be installed using BundleContext.installBundle(String, InputStream), with the InputStream object created from the given URL. The location must be the name of the ZIP entry without leading solidus ('/' \u002F). This entry must not be stored in the Provisioning Dictionary. If a bundle with this location URL is already installed in this system, then this bundle must be updated instead of installed. The Provisioning Service must install (but not start) all entries in the ZIP file that are typed with bundle or bundle-url. If an entry named PROVISIONING_START_BUNDLE is present in the Provisioning Dictionary, then its content type must be text as defined in Table 110.1. The content of this entry must match the bundle location of a previously loaded bundle. This designated bundle must be given AllPermission and started. If no PROVISIONING_START_BUNDLE entry is present in the Provisioning Dictionary, the Provisioning Dictionary should contain a reference to another ZIP file under the PROVISIONING_REFERENCE key. If both keys are absent, no further action must take place. If this PROVISIONING_REFERENCE key is present and holds a String object that can be mapped to a valid URL, then a new ZIP file must be retrieved from this URL. The PROVISIONING_REFERENCE link may be repeated multiple times in successively loaded ZIP files. Referring to a new ZIP file with such a URL allows a manufacturer to place a fixed reference inside the OSGi framework Server (in a file or smart card) that will provide some platform identifying information and then also immediately load the information from the management system. The PROVISIONING_REFERENCE link may be repeated multiple times in successively loaded ZIP files. The entry PROVISIONING_UPDATE_COUNT must be an Integer object that must be incremented on every iteration. Information retrieved while loading subsequent PROVISIONING_REFERENCE URLs may replace previous key/values in the Provisioning Dictionary, but must not erase unrecognized key/values. For example, if an assignment has assigned the key proprietary-x, with a value '3', then later assignments must not override this value, unless the later loaded ZIP file contains an entry with that name. All these updates to the Provisioning Dictionary must be stored persistently. At the same time, each entry of type bundle or bundle-url (see Table 110.1 ) must be installed and not started. Once the Management Agent has been started, the Initial Provisioning service has become operational. In this state, the Initial Provisioning service must react when the Provisioning Dictionary is updated with a new PROVISIONING_REFERENCE property. If this key is set, it should start the cycle again. For example, if the control of a OSGi framework needs to be transferred to another Remote Manager, the Management Agent should set the PROVISIONING_REFERENCE to the location of this new Remote Manager's Initial Provisioning ZIP file. This process is called re-provisioning. If errors occur during this process, the Initial Provisioning service should try to notify the Service User of the problem. The previous description is depicted in Figure 110.2 as a flow chart. The Management Agent may require configuration data that is specific to the OSGi framework instance. If this data is available outside the Management Agent bundle, the merging of this data with the Management Agent may take place in the OSGi framework. Transferring the data separately will make it possible to simplify the implementation on the server side, as it is not necessary to create personalized OSGi framework bundles. The PROVISIONING_AGENT_CONFIG key is reserved for this purpose, but the Management Agent may use another key or mechanisms if so desired. The PROVISIONING_SPID key must contain the OSGi framework Identifier. If the type parameter entry is not specified for an entry, then the type will be inferred from the extension of the entry, as defined in table Table 110.1 on page . The next section shows some examples of specially configured types of OSGi framework Servers and how they are treated with the respect to the specifications in this document. If a OSGi framework Operator is selling OSGi framework Servers branded exclusively for use with their service, the provisioning will most likely be performed prior to shipping the OSGi framework Server to the User. Typically the OSGi framework is configured with the Dictionary entry PROVISIONING_REFERENCE pointing at a location controlled by the Operator. Up-to-date bundles and additional configuration data must be loaded from that location at activation time. The OSGi framework is probably equipped with necessary security entities, like certificates, to enable secure downloads from the Operator's URL over open networks, if necessary. Circumstances might exist in which the OSGi framework Server has no WAN connectivity, or prefers not to depend on it for the purposes not covered by this specification. The non-connected case can be implemented by specifying a file:// URL for the initial ZIP file ( PROVISIONING_REFERENCE ). That file:// URL would name a local file containing the response that would otherwise be received from a remote server. The value for the Management Agent PROVISIONING_REFERENCE found in that file will be used as input to the load process. The PROVISIONING_REFERENCE may point to a bundle file stored either locally or remotely. No code changes are necessary for the non-connected scenario. The file:// URLs must be specified, and the appropriate files must be created on the OSGi framework. Provisioning information is conveyed between bundles using the Provisioning Service, as defined in the ProvisioningService interface. The Provisioning Dictionary is retrieved from the ProvisioningService object using the getInformation() method. This is a read-only Dictionary object, any changes to this Dictionary object must throw an UnsupportedOperationException. The Provisioning Service provides a number of methods to update the Provisioning Dictionary. addInformation(Dictionary) - Add all key/value pairs in the given Dictionary object to the Provisioning Dictionary. addInformation(ZipInputStream) - It is also possible to add a ZIP file to the Provisioning Service immediately. This will unpack the ZIP file and add the entries to the Provisioning Dictionary. This method must install the bundles contained in the ZIP file as described in Procedure. setInformation(Dictionary) - Set a new Provisioning Dictionary. This will remove all existing entries. Each of these method will increment the PROVISIONING_UPDATE_COUNT entry. The Management Agent should be written with great care to minimize dependencies on other packages and services, as all services in OSGi are optional. Some OSGi frameworks may have other bundles pre-installed, so it is possible that there may be exported packages and services available. Mechanisms outside the current specification, however, must be used to discover these packages and services before the Management Agent is installed. The Provisioning Service must ensure that the Management Agent is running with AllPermission. The Management Agent should check to see if the Permission Admin service is available, and establish the initial permissions as soon as possible to insure the security of the device when later bundles are installed. As the PermissionAdmin interfaces may not be present (it is an optional service), the Management Agent should export the PermissionAdmin interfaces to ensure they can be resolved. Once started, the Management Agent may retrieve its configuration data from the Provisioning Service by getting the byte object that corresponds to the PROVISIONING_AGENT_CONFIG key in the Provisioning Dictionary. The structure of the configuration data is implementation specific. The scope of this specification is to provide a mechanism to transmit the raw configuration data to the Management Agent. The Management Agent bundle may alternatively be packaged with its configuration data in the bundle, so it may not be necessary for the Management Agent bundle to use the Provisioning Service at all. Most likely, the Management Agent bundle will install other bundles to provision the OSGi framework. Installing other bundles might even involve downloading a more full featured Management Agent to replace the initial Management Agent. The file: scheme is the simplest and most completely supported scheme which can be used by the Initial Provisioning specification. It can be used to store the configuration data and Management Agent bundle on the OSGi framework Server, and avoids any outside communication. If the initial request URL has a file scheme, no parameters should be appended, because the file: scheme does not accept parameters. This section defines how HTTP and HTTPS URLs must be used with the Initial Provisioning specification. HTTP - May be used when the data exchange takes place over networks that are secured by other means, such as a Virtual Private Network (VPN) or a physically isolated network. Otherwise, HTTP is not a valid scheme because no authentication takes place. HTTPS - May be used if the OSGi framework is equipped with appropriate certificates. Caching of the Management Agent will be desired in many implementations where limited bandwidth is an issue. Both HTTP and HTTPS already contain an accepted protocol for caching. Both HTTP and HTTPS must be used with the GET method. The response is a ZIP file, implying that the response header Content-Type header must contain application/zip. In order to use HTTPS, certificates must be in place. These certificates, that are used to establish trust towards the Operator, may be made available to the OSGi framework using the Provisioning Service. The root certificate should be assigned to the Provisioning Dictionary before the HTTPS provider is used. Additionally, the OSGi framework should be equipped with a OSGi framework certificate that allows the OSGi framework to properly authenticate itself towards the Operator. This specification does not state how this certificate gets installed into the OSGi framework. The Root X.509 Certificate holds certificates used to represent a handle to a common base for establishing trust. The certificates are typically used when authenticating a Remote Manager to the OSGi framework. In this case, a Root X.509 certificate must be part of a certificate chain for the Operator's certificate. The format of the certificate is defined in Certificate Encoding. The DER encoded data is encoded into base64 to make it text. If a record contains more than one certificate, they are simply appended one after the other, each with a delimiting prefix and suffix. The URL must contain the OSGi framework Identity, and may contain more parameters. These parameters are encoded in the URL according to the HTTP(S) URL scheme. A base URL may be set by an end user but the Provisioning Service must add the OSGi framework Identifier. Proper URL encoding must be applied when the URL contains characters that are not allowed. See  RFC 2396 - Uniform Resource Identifier (URI). The RSH protocol is an OSGi-specific protocol, and is included in this specification because it is optimized for Initial Provisioning. It requires a shared secret between the management system and the OSGi framework that is small enough to be entered by the Service User. RSH bases authentication and encryption on Message Authentication Codes (MACs) that have been derived from a secret that is shared between the OSGi framework and the Operator prior to the start of the protocol execution. The protocol is based on an ordinary HTTP GET request/response, in which the request must be signed and the response must be encrypted and authenticated. Both the signature and encryption key are derived from the shared secret using Hashed Message Access Codes (HMAC) functions. As additional input to the HMAC calculations, one client-generated nonce and one server-generated nonce are used to prevent replay attacks. The nonces are fairly large random numbers that must be generated in relation to each invocation of the protocol, in order to guarantee freshness. These nonces are called clientfg (client-generated freshness guarantee) and serverfg (server-generated freshness guarantee). In order to separate the HMAC calculations for authentication and encryption, each is based on a different constant value. These constants are called the authentication constant and the encryption constant. From an abstract perspective, the protocol may be described as follows. M - Message material, used for Ke calculation. m - The calculated message authentication code. 3DES - Triple DES, encryption function, see  3DES. The bytes of the key must be set to odd parity. CBC mode must be used where the padding method is defined in  RFC 1423 Part III: Algorithms, Modes, and Identifiers. In  Java Cryptography API (part of Java 1.4) this is addressed as PKCS5Padding. IV - Initialization vector for 3DES. SHA1 - Secure Hash Algorithm to generate the Hashed Message Authentication Code, see  SHA-1. The function takes a single parameter, the block to be worked upon. HMAC - The function that calculates a message authentication code, which must HMAC-SHA1. HMAC-SHA1 is defined in  HMAC: Keyed-Hashing for Message Authentication. The HMAC function takes a key and a block to be worked upon as arguments. Note that the lower 16 bytes of the result must be used. - Indicates access to a sub-part of a variable, in bytes. Index starts at one, not zero. In each step, the emphasized server or client indicates the context of the calculation. If both are used at the same time, each variable will have server or client as a subscript. The client sends the request with the clientfg to the server. The server generates a nonce and denotes it serverfg. The server calculates an authentication key based on the SHA1 function, the shared secret, the received clientfg, the serverfg and the authentication constant. The server calculates an encryption key using an SHA-1 function, the shared secret, the received clientfg, the serverfg and the encryption constant. It must first calculate the key material M.
The key for DES consists Ke and IV. The server encrypts the response data using the encryption key derived in step 5. The encryption algorithm that must be used to encrypt/decrypt the response data is 3DES. 24 bytes (192 bits) from M are used to generate Ke, but the low order bit of each byte must be used as an odd parity bit. This means that before using Ke, each byte must be processed to set the low order bit so that the byte has odd parity. The server calculates a MAC m using the HMAC function, the encrypted response data and the authentication key derived in 4. The client calculates the encryption key Ke the same way the server did in steps 5 and 6, and uses this to decrypt the encrypted response data. The serverfg value received in the response is used in the calculation. The client performs the calculation of the MAC m' in the same way the server did, and checks that the results match the received MAC m. If they do not match, further processing is discarded. The serverfg value received in the response is used in the calculation. The shared secret should be a key of length 160 bits (20 bytes) or more. The length is selected to match the output of the selected hash algorithm  NIST, FIPS PUB 180-1: Secure Hash Standard, April 1995. In some scenarios, the shared secret is generated by the Operator and communicated to the User, who inserts the secret into the OSGi framework through some unspecified means. The opposite is also possible: the shared secret can be stored within the OSGi framework, extracted from it, and then communicated to the Operator. In this scenario, the source of the shared secret could be either the OSGi framework or the Operator. In order for the server to calculate the authentication and encryption keys, it requires the proper shared secret. The server must have access to many different shared secrets, one for each OSGi framework it is to support. To be able to resolve this issue, the server must typically also have access to the OSGi framework Identifier of the OSGi framework. The normal way for the server to know the OSGi framework Identifier is through the application protocol, as this value is part of the URL encoded parameters of the HTTP, HTTPS, or RSH mapping of the Initial Provisioning. In order to be able to switch Operators, a new shared secret must be used. The new secret may be generated by the new Operator and then inserted into the OSGi framework device using a mechanism not covered by this specification. Or the device itself may generate the new secret and convey it to the owner of the device using a display device or read-out, which is then communicated to the new operator out-of-band. Additionally, the generation of the new secret may be triggered by some external event, like holding down a button for a specified amount of time. RSH is mapped to HTTP or HTTPS. Thus, the request parameters are URL encoded as discussed in URL Encoding. RSH requires an additional parameter in the URL: the clientfg parameter. This parameter is a nonce that is used to counter replay attacks. See also RSH Transport. These three items are packaged into a binary container according to Table 110.2. The response content type is an RSH-specific encrypted ZIP file, implying that the response header Content-Type must be application/x-rsh for the HTTP request. When the content file is decrypted, the content must be a ZIP file. The value of this entry is a byte containing the shared secret used by the RSH protocol. The Initial Provisioning process is a sensitive process that must run without user supervision. There is therefore a need to handle exceptional cases in a well defined way to simplify trouble shooting. IO Exception when reading or writing provisioning information. IO Exception when retrieving or processing a provisioning zip file. Other exceptions can occur and the Provisioning Service must do any attempt to log these events. A human readable string describing the error. The provisioning.update.count will be incremented as normal when a provisioning.error entry is added to the provisioning information. After, the provisioning service will take no further action. The security model for the OSGi framework is based on the integrity of the Management Agent deployment. If any of the mechanisms used during the deployment of management agents are weak, or can be compromised, the whole security model becomes weak. From a security perspective, one attractive means of information exchange would be a smart card. This approach enables all relevant information to be stored in a single place. The Operator could then provide the information to the OSGi framework by inserting the smart card into the OSGi framework. The integrity and confidentiality of the Management Agent, certificates, and configuration data are fully protected if they are transported over public transports. Each mapping of the Initial Provisioning specification to a concrete implementation must describe how these goals are met. Secrets for long-term use may be exchanged during the Initial Provisioning procedures. This way, one or more secrets may be shared securely, assuming that the Provisioning Dictionary assignments used are implemented with the proper security characteristics. The provisioning information may contain sensitive information. Also, the ability to modify provisioning information can have drastic consequences. Thus, only trusted bundles should be allowed to register, or get the Provisioning Service. This restriction can be enforced using ServicePermission[ ProvisioningService, GET]. No Permission classes guard reading or modification of the Provisioning Dictionary, so care must be taken not to leak the Dictionary object received from the Provisioning Service to bundles that are not trusted. Whether message-based or connection-based, the communications used for Initial Provisioning must support mutual authentication and message integrity checking, at a minimum. By using both server and client authentication in HTTPS, the problem of establishing identity is solved. In addition, HTTPS will encrypt the transmitted data. HTTPS requires a Public Key Infrastructure implementation in order to retrieve the required certificates. When RSH is used, it is vital that the shared secret is shared only between the Operator and the OSGi framework, and no one else. ProvisioningService - Service for managing the initial provisioning information. 110.11.2.1 public static final String INITIALPROVISIONING_ENTRIES = "InitialProvisioning-Entries"
110.11.2.2 public static final String MIME_BUNDLE = "application/vnd.osgi.bundle"
110.11.2.3 public static final String MIME_BUNDLE_ALT = "application/x-osgi-bundle"
110.11.2.4 public static final String MIME_BUNDLE_URL = "text/x-osgi-bundle-url"
110.11.2.5 public static final String MIME_BYTE_ARRAY = "application/octet-stream"
110.11.2.6 public static final String MIME_STRING = "text/plain;charset=utf-8"
110.11.2.7 public static final String PROVISIONING_AGENT_CONFIG = "provisioning.agent.config"
110.11.2.8 public static final String PROVISIONING_REFERENCE = "provisioning.reference"
110.11.2.9 public static final String PROVISIONING_ROOTX509 = "provisioning.rootx509"
110.11.2.10 public static final String PROVISIONING_RSH_SECRET = "provisioning.rsh.secret"
110.11.2.11 public static final String PROVISIONING_SPID = "provisioning.spid"
110.11.2.12 public static final String PROVISIONING_START_BUNDLE = "provisioning.start.bundle"
110.11.2.13 public static final String PROVISIONING_UPDATE_COUNT = "provisioning.update.count"
info the set of Provisioning Information key/value pairs to add to the Provisioning Information dictionary. Any keys are values that are of an invalid type will be silently ignored. □ Adds the key/value pairs contained in info to the Provisioning Information dictionary. This method causes the PROVISIONING_UPDATE_COUNT to be incremented. zis the ZipInputStream that will be used to add key/value pairs to the Provisioning Information dictionary and install and start bundles. If a ZipEntry does not have an Extra field that corresponds to one of the four defined MIME types (MIME_STRING, MIME_BYTE_ARRAY, MIME_BUNDLE, and MIME_BUNDLE_URL) in will be silently ignored. □ Processes the ZipInputStream and extracts information to add to the Provisioning Information dictionary, as well as, install/update and start bundles. This method causes the PROVISIONING_UPDATE_COUNT to be incremented. Throws IOException– if an error occurs while processing the ZipInputStream. No additions will be made to the Provisioning Information dictionary and no bundles must be started or installed. □ Returns a reference to the Provisioning Dictionary. Any change operations (put and remove) to the dictionary will cause an UnsupportedOperationException to be thrown. Changes must be done using the setInformation and addInformation methods of this service. info the new set of Provisioning Information key/value pairs. Any keys are values that are of an invalid type will be silently ignored. □ Replaces the Provisioning Information dictionary with the key/value pairs contained in info. Any key/value pairs not in info will be removed from the Provisioning Information dictionary. This method causes the PROVISIONING_UPDATE_COUNT to be incremented. Hypertext Transfer Protocol - HTTP/1.1http://www.ietf.org/rfc/rfc2616.txt Fielding, R., et. al.